"Hall of fame", "Walk of fame", and "Wall of fame" redirect here. For other uses, see Hall of fame (disambiguation), Walk of fame (disambiguation), and Wall of fame (disambiguation). A hall, wall, or walk of fame is a list of individuals, achievements, or animals, usually chosen by a group of electors, to mark their fame in their field. In some cases, these halls of fame consist of actual halls or museums which enshrine the honorees with sculptures, plaques, and displays of memorabilia and general information regarding the inducted recipients. Sometimes, the honorees' plaques may instead be posted on a wall (hence a "wall of fame") or inscribed on a sidewalk (as in a "walk of fame", walk of stars or "avenue of fame"). In other cases, the hall of fame is more figurative and simply consists of a list of names of noteworthy people and their achievements and contributions. The lists are maintained by an organization or community, and may be national, state, local, or private. The English-language term was popularised in the United States by the Hall of Fame for Great Americans at Bronx Community College, in New York City, in the form of a sculpture gallery completed in 1900 and officially declared the following year in 1901. Its inspiration is the Ruhmeshalle ("Hall of Fame") in Munich, Germany. The Walhalla memorial in Bavaria, Germany, is an even earlier hall of fame, conceived in 1807 and built between 1830 and 1842. The meaning of "fame" has changed over the years, originally meaning "renown" as opposed to today's more common meaning of "celebrity." Look up hall of fame or halls of fame in Wiktionary, the free dictionary. Wikimedia Commons has media related to Halls of fame. ^ R. Rubin (1997). "The Mall of Fame". The Atlantic Monthly. 280 (1): 14–18. ^ S. Pajot (30 April 2014). "Gloria Estefan, Five Others Being Inducted to Latin Songwriters Hall of Fame". Retrieved 22 September 2014. ^ "Nashville Songwriters Hall of Fame". nashvillesongwritersfoundation.com. Retrieved 27 August 2017. ^ Requena, Pablo (1 August 2015). "Un 'Paseo de la Fama' en Almería (con ruta ociosa incluida)". Weeky. La agenda Pirata de la provincia de Almería (in Spanish). Retrieved 12 November 2017. ^ * "The Bronx Walk of Fame". Archived from the original on 2013-11-02. Retrieved 2013-10-31. ^ "Hollywood Walk of Fame". 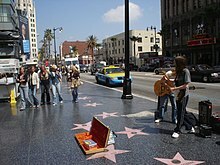 www.walkoffame.com. Retrieved 27 August 2017. ^ "Piotrkowska 65–67". Urząd Miasta Łodzi. Archived from the original on 2012-03-22. Retrieved 2018-01-14. ^ "Piotrkowska 71–77". Urząd Miasta Łodzi. Archived from the original on 2012-03-22. Retrieved 2018-01-14. ^ "Piotrkowska 76–78". Urząd Miasta Łodzi. Archived from the original on 2012-03-22. Retrieved 2018-01-14. ^ "Hotel Grand". Urząd Miasta Łodzi. Archived from the original on 2012-03-22. Retrieved 2018-01-14.